There’s a surf shop logo that’s recognizable around the globe, even spotted 200 miles above the Earth on the Space Station Mir. Now that familiar brand is making waves in Orange Beach, Alabama. Open since Summer 2015, Ron Jon Surf Shop has everything you need for an epic day at the beach and beyond. For starters, you probably need to pick up one of the logo T-shirts — a classic and comfy signature look that makes the perfect souvenir of your Gulf Coast stay. Ron Jon got its start more than 50 years ago in New Jersey, but today has many storefronts and even a surfing school in Florida and, most recently, here on the Gulf Coast of Alabama. The new location is the twelfth, and the most westerly, according to General Manager Laura Bethon. From the shopping customers to the friendly staffers, it’s always bustling with activity. If you’re one of them, Lewis says you can look forward to a bright, fun shopping destination with a great selection of surf, swim and beach essentials. You’ll find skimboards, surfboards, paddle boards and skateboards … beach toys, swimsuits, fishing poles, flip-flops and clothes. It’s the only place to find Ron Jon branded gear and the particular brand of friendly service for which they’re known. “We also pride ourselves on great customer service and a fun shopping environment, with live music and family-friendly events during the busy season,” Lewis shares. After all, that’s why you’re here, isn’t it? Embrace the beach life at Ron Jon Surf Shop. 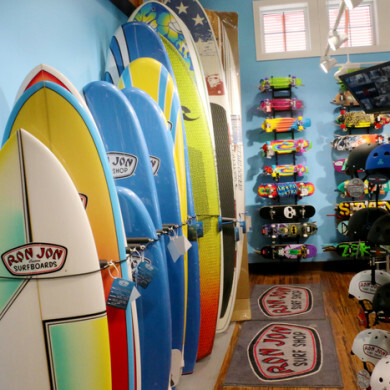 Ron Jon Surf Shop is located at 22723 Perdido Beach Boulevard in Orange Beach, AL. For more information, visit the Ron Jon website or call (251) 981-8008.